For this weeks From Page To Screen I have decided to cover Interview with the Vampire by Anne Rice. Here's a bit of back story in case some of you aren't familiar with the novel. 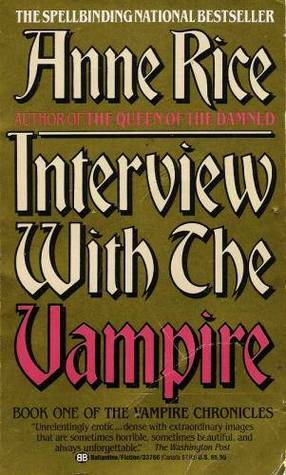 Interview with the Vampire is a novel written by Author Anne Rice. The book was originally published April 12, 1976 by Alfred A. Knopf. Interview with the Vampire was Anne Rice's debut novel and was adapted from a short story that she had written in the late 60's. While the book released to mixed reviews it quickly garnered a cult like following and the series now titled The Vampire Chronicles includes 9 books and a spin-off series called New Tales of the Vampires. Louis de Pointe du Lac- Louis is a 25 year old creole plantation owner who starts living recklessly after the death of his brother. Lestat finds Louis interesting and decides to turn him into a vampire. Louis is uncomfortable with his vampire lifestyle and decides to live on rats and other creatures instead of killing humans who he feels empathy for. Lestat de Lioncourt- Lestat is an Aristocrat who loves the finer things in life. In the year of 1791 he comes across plantation owner Louis and decides to make him into a vampire as he reminds him of his best friend Nicolas who died some years earlier. Lestat is fluent in French and English and is a lover of books due to growing up mostly illiterate. Claudia- Claudia is a young girl living in New Orleans. After her parents both die of the plague Louis finds her crying outside her house and feeds on her. After being "saved" by Lestat and brought back to their home he turns her into a child vampire. Louis at first is horrified by what Lestat has done but quickly falls in love with Claudia and tries to teach her that their is more to life than just killing. Daniel Molloy- A young reporter who becomes obsessed with finding Lestat. He instead ends up interviewing Louis. Now let's discuss the movie. In case some of you aren't familiar with the film, here is a bit of back story. Interview with the Vampire is a film directed by Neil Jordan and was released November 11, 1994 by Warner Bros. Pictures. Interview with the Vampire cost $60 million to make and went on to make over $223 million worldwide. Fun Fact: Originally River Phoenix was cast for the part of Daniel but died 4 weeks before filming started. Christian Slater who took over the role donated his entire salary to River Phoenix's favorite charities. Louis is depressed and wants to die after his brother dies. Louis is depressed and wants to die because his wife and child die. Drinking blood from someone who is dead has no effect on the vampire. Lestat mentions drinking blood from someone whose already dead might be fatal to the vampire. When Claudia gifts poisoned twin boys to Lestat he is weakened due to the Absinthe and laudanum in their blood. Lestat is weakened due to the boys being dead not from the drugs she poisoned them with. Lestat testifies to Armand in Paris that Claudia tried to kill him. Lestat never appears in Paris after Claudia tries to kill him. Claudia is between 4 and 5 years old when she is made into a vampire. Claudia is a pre-teen when she is a made into a vampire. Lestat cares for his aging father and brings him to Louis's plantation to take care of him. Lestat arrives alone and never mentions his past. While traveling Claudia and Louis encounter some mindless vampires in Transylvania. Claudia and Louis do not meet any vampires until they arrive in Paris. After learning about the newborn army, Jasper tells Bella his story. After a training session with the wolves Jasper tells Bella his story. Louis becomes annoyed with Daniel after he asks to become a vampire so he feeds on him. Daniel wakes up the next day determined to find Lestat. Daniel is seen driving through the Golden Gate bridge when his is attacked by Lestat. Lestat offers him the chance to live or die. We never see what happens to him after that. Louis is in love with his neighbor Babette. When she suspects that Louis and Lestat have become monsters she tries to kill Louis. Lestat tries to kill her but Louis stop him. She later goes insane. Babette is completely omitted. The last time Louis sees Lestat he spots him with a boy and a baby. The last time Louis sees Lestat he is alone. After Claudia dies Louis travels with Armand. Louis avoids Armand because he knows he had a hand in Claudia's death. These are the biggest changes I noticed when the book was taken From Page To Screen. Which however do I prefer? You know I really can't decide. I'm such a huge fan of both the book and the film. Yes, I know the film does take a few liberties with events in the book but overall it really is a close adaptation. So this week I'll call it a tie. 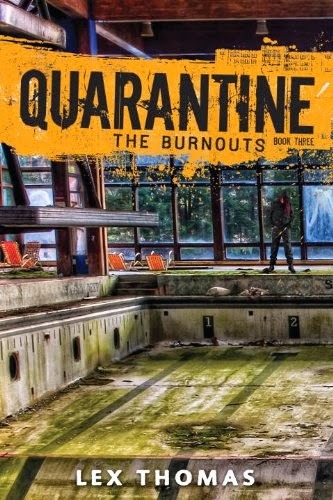 If you haven't read the book yet I highly recommend doing so. You will learn a great deal of background about the characters that the movie omits for time. If you haven't seen the film definitely check it out as well. Even though the film is almost 20 years old it is still great. Kirsten Dunst as Claudia is perfect and I just love Brad Pitt and Tom Cruise as Louis and Lestat. Still undecided? Check out the film trailer below! _____________________________________________Well that about wraps up this weeks From Page To Screen. Have a recommendation for an upcoming From Page To Screen, let me know in the comments below! What is your favorite quote or scene from Interview with the Vampire? Just for fun: Which Vampire (Lestat or Louis) would you like to be your maker? Love this movie, but I've never actually read any Anne Rice. My husband keeps saying he thinks he'd read these if I bought them, but considering he pretty much only reads non-fiction these days, I don't buy it. :P Oh, and I didn't know that tidbit about River Phoenix and Christian Slater. Nice. Sad, but nice. Oh you need to read her books they are great. Start with this series if you do or The Mayfair Witches.